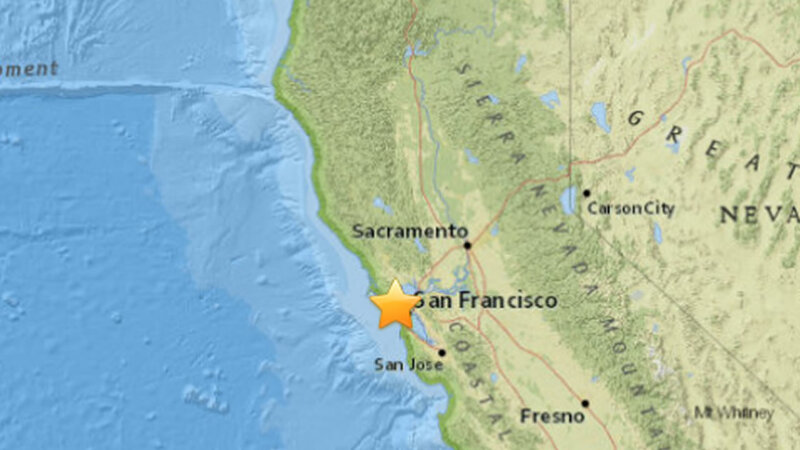 SAN FRANCISCO (KGO) -- The U.S. Geological Survey reports a magnitude 3.3 earthquake hit nine miles west of San Francisco on Sunday afternoon. According to the USGS, the tremor was recorded just before 1:30 p.m. at an estimated depth of 6.9 miles. San Francisco police say no damage has been reported and they have not received any 911 calls in association with the quake. As of 1:45 p.m., there were no current tsunami advisories or warnings in effect for the Pacific Ocean, according to the Pacific Tsunami Warning Center. If you would like to report that you felt, click here to report it to USGS. If you see news where you live, tag your photos and videos on Twitter, Instagram, or Facebook with #abc7now. Click here to check out the most recent earthquakes here in the Bay Area and around the world, and click here to take a look at the ABC7 News Prepare NorCal resource page to prepare for the next disaster. @abc7newsBayArea I'm @Ocean Beach. Felt it instantly. @abc7newsBayArea @USGS I felt it in Oakland (Jack London Square). @abc7newsBayArea @USGS Yes, I'm the 3rd Street area and it was strong over here. @abc7newsBayArea yep, felt it in Noe Valley. @abc7newsBayArea @USGS felt like someone tapped the side or house with their car. Slow speed of course. @abc7newsBayArea @USGS Yup, felt it in SF's mission district.